For over 30 years, LEX / Hippo Family Club members have enjoyed sharing languages from all around the world. Both adults and children can learn to speak any number of languages when they use the same process they used to acquire their own native languages. *Hippo Family Club’s original materials include Arabic, Cantonese, Chinese, English, French, German, Hindi, Indonesian, Italian, Japanese, Korean, Malaysian, Portuguese, Russian, Spanish, Swahili, Swedish, Taiwanese, Thai, Turkish, and Vietnamese. Just as a baby begins to understand and speak its mother tongue before ever seeing a textbook or vocabulary list, members of LEX / Hippo Family Club enjoy learning languages naturally through immersion. No special skills are required to speak many languages; only a good environment where the sound of languages can be absorbed naturally. Our language CDs are recorded by native speakers and include stories about everyday life. We create a natural immersion environment for ourselves by listening to these CDs like background music as often as possible while doing other activities at home, in the car, etc. As we listen to the CDs, we absorb the sounds and patterns of the languages in context. Little by little, and with support from other club members, our own speech becomes like that of the native speakers on the CDs. Language is nurtured in people-to-people connections. In addition to listening to CDs, members get together in community-based clubs at least once a week to share the sounds of languages we are internalizing from the CDs. We sing, dance, play games, listen to CDs, and speak in various languages. We absorb new language at the club meetings, while encouraging each other to speak in a fun and supportive environment. Listening to the CDs and participating in the club meetings are both equally important in the natural process of language development. The activity of "singing the sounds" is important at LEX / Hippo Family Club. This is a process of mimicking the CD and is similar to humming or singing, or even the babbling of a baby. Emphasis is placed on maintaining the rhythm, melody, and natural patterns of a language. An essential element of this multilingual environment is incorporating members from around the world. LEX / Hippo Family Club Transnational Exchange allows members to spend time in the homes of families in numerous countries. Children as well as adults immerse themselves in their host culture not as tourists, but as members of a family. Members also have the opportunity to host international visitors in their own homes. Homestay exchanges offer the ideal means for you and your family to learn about a new country, to examine your own culture through new eyes, and to build lifelong friendships. There are opportunities to host, as well as to travel to more than 20 different countries! The Family Exchange is a one or two week homestay program for individuals and families with children. The program has existed since 1981 and has expanded to include exchanges with over 20 countries worldwide. Approximately 400 members go overseas annually to initiate new friendships. The Youth Exchange is a one-week to one-month homestay program during the spring and summer for children from 10 years old to university students. Youth go overseas to the US, Mexico, Korea, Taiwan, Russia, Malaysia, Thailand, Australia, France, Italy, Germany, etc. Stepping out from the comfort of their parentsﾕ wings, approximately 650 children depart annually to participate in an unforgettable experience in another country. 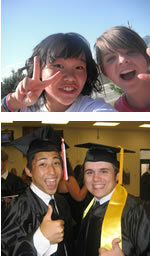 The Academic Yearlong High School Exchange began in 1997 and continues to expand each year. Approximately 120 high school students depart annually to spend 10-11 months in Canada, the US, Mexico, Brazil, Germany, France, Spain, Italy, Malaysia, Thailand, Australia, etc. Students stay with host families and attend high schools in their host countries. The studentsﾕ yearlong academic and homestay experiences are once in a lifetime opportunities and challenges. Hippo Asian Project:"Asian Multilingual Youth / Nature Camp"
To promote more "Multilingual Friends Around the World" especially in Asian countries, two youth camps were initiated under "Hippo Asian Project." "Asian Multilingual Youth Camp in Shanghai" is for university students and youths from China, Korea, Japan and all over Asia and the world to spend 4 days and 3 nights together, while "Asian Multilingual Nature Camp in Thailand (for 6 days and 5 nights)" is geared toward secondary school students from different countries. Every year, lots of youths enjoy meeting new friends from different countries and sharing language differences. 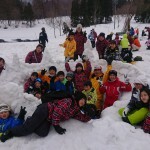 Another highlight of the camps is nature experiences and outdoor activities. Through these activities, the participants gain a broader perspective of the world, learn to recognize the similarities in each other, and develop new friendships. WIP is a exciting new opportunity providing adults of all ages with a life-changing exchange experience in another country. WIP interns will spend 1-12 months volunteering with LEX in Japan, Korea, the US, Mexico, or with our partner organizations in up to 40 different countries around the world, while living with a host family and absorbing the rhythms of daily life. Open to qualified adults, age 18 and up. In Japan, the Hippo Transnational Homestay for families, youth, exchange students and trainees from overseas is very popular. 5,000 people from over 120 different countries participate annually in this program which consists of one-night homestays to long-term stays with a LEX family in Japan. The visitors are exchange students, company trainees, and adults and youths from our partner organizations all over the world. 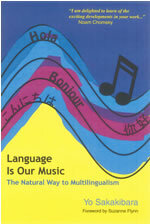 The much-anticipated English version of Yo Sakakibara’s Language Is Our Music: The Natural Way to Multilingualism was published in 2013! 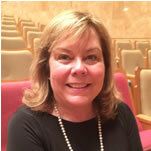 The foundational view of Sakakibara regarding the nature of language and the nature of human beings has many points of congruence with Dr. Suzanne Flynnﾕs discoveries from her 30 some years of research on multilingualism. It is in this context of mutual discovery that Dr. Flynn accepted our invitation to offer a Foreword to this work by Yo Sakakibara. In this foreword, I would like to explore certain major properties of language acquisition and multilingualism. 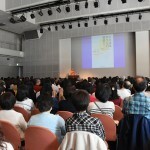 I would also like to demonstrate how LEX / Hippo Family Club, a network of community-based language clubs that grew out of the innovative ideas proposed by Yo Sakakibara, embodies so much of what we know to be true about the language learning process. LEX / Hippo incorporates all those aspects I have learned are important through my research. What you have in LEX / Hippo is the perfect example of the kind of program that I would develop if I were designing one myself. Itﾕs just extraordinary! In 2006, when I first encountered the LEX organization, I was very surprised to learn that the principles that underlie the LEX / Hippo program are the same as those I have come to learn about and understand in over 30 years of multilingual research. LEX founder Yo Sakakibara had the insight and the brilliance to understand this before the research was available. Today we have empirical research that supports his work with the LEX / Hippo program.After more than 30 years of study and research, I am still driven by a desire to understand language and its power. I have learned twelve principles. 1. Language is a unique and special human capacity. 2. There is really only one human language. 3. A child is not taught language. 4. Multilingualism is the natural state of the human mind. 5. There is no limit to the number of languages one can learn. 6. Everyone can learn a new language regardless of age as long as there is desire. 7. The more languages you know, the easier it gets. 8. The easiest way to learn a new language is in a naturalistic setting. 9. You never lose the languages you acquire. 10. Maintaining fluency is easiest when there is a need to be multilingual. 11. Knowing multiple languages has long-lasting positive consequences at multiple levels throughout one’s lifetime. 12. The more languages you learn, the smaller the world gets and the greater your understanding of the world and its people. Copyright © 2019 LEX Institute / Hippo Family Club All rights Reserved.